Despite it’s name, the Kona Cafe is the Polynesian Resort’s main table service restaurant and is not really a "cafe" per-say. The popular dining location on the second floor of the main building (the same level that the monorails are on), serves up mostly American fare, with flairs of Asian and Pacific Tropical cuisine here and there. 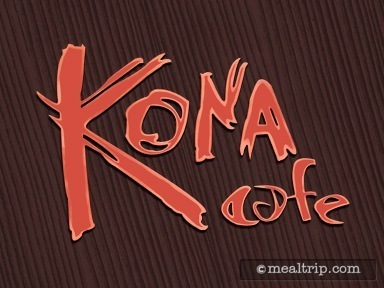 The term "cafe" comes into play when describing the Kona’s ambience... despite looking peaceful and rich in photos, it’s actually a very open and loud dining location. This is not the place for a romantic dinner, unless you go very, very late in the dining period and the restaurant has mostly emptied out. While Kona is said to have an on-stage kitchen, the tables are not really set up so that you can see what’s going on in the small prep area that Disney is referring to as the “kitchen”. There is no review text associated with this review. It's scores only.